This small sculpture, only about thirteen centimetres tall, is a miniature masterpiece of Polynesian wood carving. It is attached to a slender, tapering shaft, flattened and perforated at the base, and may therefore have been the handle of a sacred flywhisk. The London collector and dealer W O Oldman recorded that it came from the Hervey Islands (an old name for part of the southern Cook Islands), although some scholars have attributed it to the Society Islands on stylistic grounds. 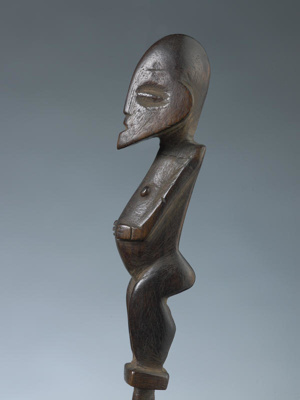 Records indicate that the carving was brought to England in 1825 by George Bennett, a London Missionary Society worker based in the Society Islands. During the 1820s, many 'idols' from the Cook Islands fell into missionary hands. A number of them were illustrated and described by the missionary William Ellis in 1829 and were subsequently acquired by Oldman, as this carving was.